About 10 years before I was married with kids of my own I was traveling in China with a friend. Climbing the steep sections of the Great Wall at Mutianyu, I was surprised and inspired by a young Australian couple climbing alongside us… with a 10 month old baby strapped to their back. I hadn’t yet met my husband but I swore to myself in that moment that the man I’d marry would share my love of travel and like that Australian couple, we’d never let kids stop us from exploring. 13 years and 2 kids later, its not as easy as that amazing Australian family make it look but we still do travel with our kids. My hat goes off to those amazing families we probably all follow on IG — the ones who sold it all, live life on the road and travel to the farthest corners of the world with little ones in tow. They inspire us all but for most of us that lifestyle is not realistic - maybe not even desirable. For our family, there’s a long list of reasons we’ll never be that family that packs it up and sets off for a year. But that won’t stop us from exploring and traveling every opportunity we can. We’re often asked by friends & colleagues how (and why) we travel with such little kids - now 1 & 3. Like us, they love to travel but now with kids and jobs don’t have the freedom they once did. They feel intimidated trying to figure out where to go that’s kid friendly enough without sacrificing their own fun. Here to tell you, it is possible and doesn’t have to be hard. 1. Throw out your pre-kid rule book & list of “I’d never go there” places. Giving it to you straight, right upfront. You may have climbed the Great Wall, swam with sharks, found hidden waterfalls in rainforests and ate at Michelin star restaurants before kids. But if you want to survive traveling with little kids, you need to open your mind to new experiences and new ways of traveling. I’m not saying you need to cater every decision to what kids want over you. But traveling post-kids is not as easy as just adding baby + all of their stuff. Before you pick a destination and map out your plans, consider the experience for your kid(s). Consider eating, sleeping & playing routines. If the next place on your bucket list isn’t conducive to them, maybe stick a pin in that one and move on to the next. There’s always time for that when kids are a little bit older and/or you have the chance to escape without them. Keep the kids happy and you’ll actually be able to enjoy your experience - for yourself and as you watch them explore & discover. Hilton Head island was a total surprise for us! we booked this as a last-minute, zika free & family friendly option and ended up Loving it way more than expected! Traveling with a stroller can make or break you - and I’ve lived it both ways. What you want in a stroller is 4 things: Light weight, easy collapse, easy washing & a great recline. Forget those expensive, heavy, Rolls-Royce of strollers - all it will give you is stress and a sore back trying to get it on/off planes, buses, subways, elevators, etc. If it’s too heavy to pick up & collapse with one hand and too expensive to cooly watch be showered with applesauce, this is not the right stroller for traveling. Standard umbrella strollers are also a big no-no for us… they’re not comfortable for the long-haul and terrible for sleeping/napping. 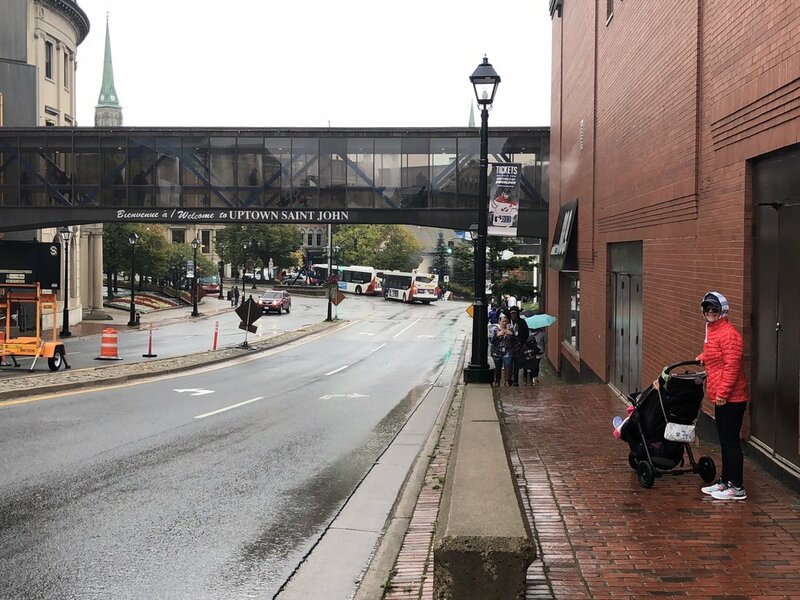 For us, the City Mini / GT’s are #1 — they’re light, collapse with one hand and unlike umbrella strollers or smaller travel strollers they offer a full & comfy recline. This is KEY for giving kids a safe haven & comfy place to relax when they’re ready to check out of your adventure and take a great nap. They also offer some life saving accessories like the click-on cupholder & tray which has doubled as my kids’ dining table & “stay right there” restraint when I can’t get the harness on fast enough. city-mini (and GT for bigger kids) are light, super durable, easy to wash & affordable. durable, comfy, great recline and super easy to travel with! Maybe city vacationing hasn’t historically toped your list of favorite ways to relax. But some of our favorite & easiest vacations post kids have been in cities. And now knowing what we do, I’ll opt for a highly pedestrian city over a beach vacation with little ones any day of the week. Safety & walkability - can you freely walk from place to place? Parks and/or kid-friendly public places - they need a chance to run! Weather - Not the most critical but it predictable and moderate weather means less stress / less stuff you’re carrying to keep kids cool, warm, dry, etc. Some of our favorites to date have been London, Barcelona, Lisbon, Copenhagen and Paris. State side we love D.C., Boston, Chicago, New York and Savannah. Many runners up (Santa Monica, Austin to name a few) but we prefer more pedestrian places where we can minimize need for a car. Don’t get me wrong, I love the luxury of a great hotel but once we discovered the wonder of apartment style vacationing, its hard to go back. The right hotel / home rental can give you perks that far outweigh room service & maid service: more space, a kitchen and LAUNDRY! It’s nice to tuck the kids away into their own bedroom at the end of the night. Having a kitchen makes it easier to tend to picky kids and avoid the pressure of constantly running out for meals. We don't do crazy cooking but Mac & Cheese and PBJ are standard travel fare. And Laundry is a complete game changer… you can easily pack lighter if you know you have easy access to a washer & dryer at the end of each day. we’re disney vacation club owners & big fans of airbnb! I know there are many fellow Disney Lovers following me but I also know many people who shudder at the thought - although I’m not sure why! Disney doesn’t HAVE to mean long days in parks, waiting on insane lines with screaming kids. if you wanted to, you can avoid parks and characters all together (although I don’t recommend that either.). 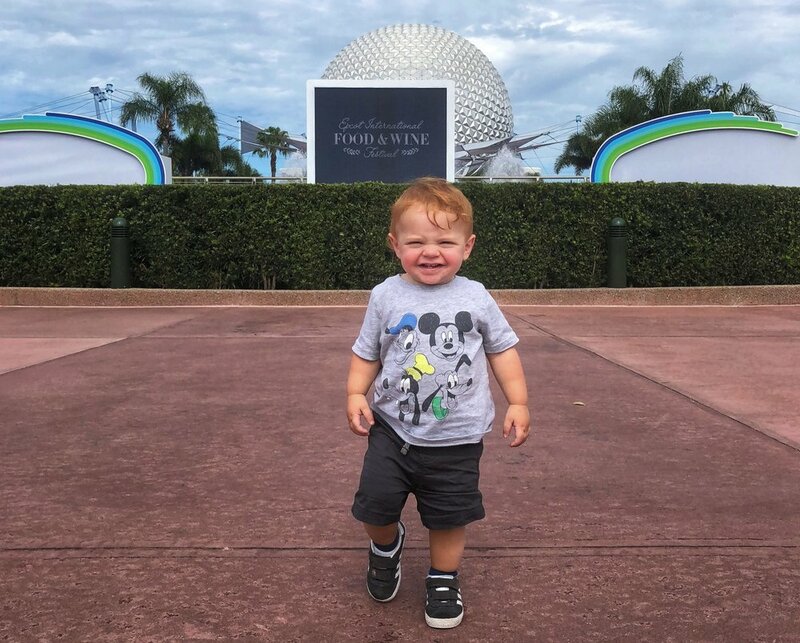 What Disney DOES offer is super easy, kid friendly and kid understanding EVERYTHING. Flying to Disney World - you can check your luggage at your home airport and have it delivered directly to your hotel room? Kid throws a fit at dinner / throws a full plate of food on the floor - no worries, they got it. Whatever it is, they are ready for your kids and any of the curveballs they throw. There are nicer restaurant options if that’s your thing and an abundance of non-park related recreation. Skip Mickey if he’s not your guy but this is a super easy way to get away with babies. 6. Want it all? Cruise! Same folks who rolled their eyes at Disney are probably doing the same about this recco. Some of us aren’t cut out for the backpackers life - even without kids! Just because we need a little ease & luxury doesn't mean we don’t want to see a lot! Will cruising give you the deep, live-like-a-local experience? No. But consider it like a tasting menu vs. ordering one full entree. You’ll get a taste of everything and then decide if/when you want to return! With kids, especially little ones, this is by far the easiest way to travel and can be cost effective. We’ve tried multiple cruise lines, some cheaper than others, but found Disney is worth the splurge — beautiful cabins, great service, better food than most (especially at upgraded dining) and kids’ clubs/nursery options that make it easy and guiltless to run off to the spa, have a kid-free dinner or even leave the ship for bigger adventures not conducive to kids. You also can’t discount the convenience of unpacking once and still getting to travel to many different destinations. We opt for window rooms in close proximity laundry to make it that much easier and enjoyable for traveling with babies! For more details on our most recent cruise, check out the previous “Halloween on the High Seas” blog post! Back in August Eric and I had the amazing opportunity to ditch the kids and take a vacation alone. You heard me right, ALONE. I like to joke that we tricked my mom and our Nanny (now besties) into taking the kids for a week but somehow we actually got lucky enough to have them volunteer for that adventure. Crazy, right? After surviving 12 months of 2-under-4, we needed a chance to reconnect, catch up on sleep and enjoy some meals that did not involve mac & cheese or holding a child on my lap. With a Delta companion pass to save us one flight, we picked the farthest place the freebie ticket would get us and high-tailed it out of here before someone could ask if my 1 year old was sleeping through the night yet. (Answer: No.). So off we went. We’d both been to Northern California & San Francisco years ago, but never went together. And there was a long list of things we’d both not yet seen but always wanted to. Alcatraz unfortunately still outstanding. But even minus a visit to The Rock, we had an incredible jam-packed trip exploring, relaxing and eating our way through N. Cali. Then over the Golden Gate Bridge and up to the Muir Woods too see the Redwoods. There were so many standout moments for this trip but (perhaps no surprise) many of them involved the incredible food we had. From the super-cheap back alley treats to the splurge meals and chance Thomas Keller sighting (cue fan-girl moment), this trip was a foodie’s fantasy. Rounding up the top 5 meals & munches we’re happy to recommend and would gladly return to. Check it out. 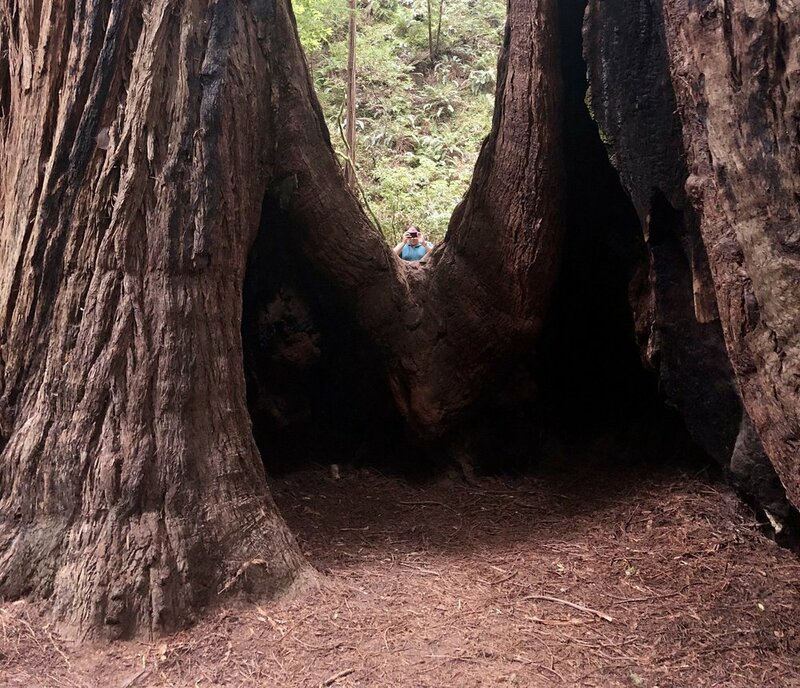 And let us know what places we may have missed that should be added to itinerary next time we’re back in N. California. The oldest operating Dim Sum Restaurant, this place hit the spot on our first jet-lagged night in SF. This place is tucked away down an Alley and once you get inside its nothing special at all. But sometimes those are the best places! No frills, just great food. And this place delivered. With a super-affordable and really wide menu of small-bites to choose from, we loaded up on anything & everything that sounded great. We walked away an hour later stuffed, satisfied and for under $40. We hadn’t even been in SF 4 hours and I was already contemplating a return. We didn’t have a chance to hit this spot again on the trip but I’d happily return next time. Favorites included the scallion pancake (amazing), shrimp dumplings, soup dumplings and meatballs. I will say, as much as people rave about the porkbelly bun I was not a fan. Doughy and pork filling was only so-so. Really don’t understand the hype of this one. A must-stop on Eric’s list, we made a quick stop here to load up on breakfast / munchies for our roadtrip day down to Monterey. Parking is tough in the area and the line outside was long so I left Eric in the car and went in with instructions to get a couple of things to share. I panicked not knowing what to choose and walked out with a box so full the woman helping me thought I was hosting a brunch. Good thing there’s no calories on vacation because somehow we finished the box. And since they were all so good the only thing I can recommend is you do the same. Pretend you’re having a brunch and order it all. My personal favs were the Morning Bun, Almond Croissant and Ham & Cheese Croissant. But the scones were pretty insane as well. This place was an impromptu choice for our first night in Napa. With a few splurge meals & tastings on the itinerary we were looking for someplace affordable, fun & casual. We were starving so the wait to get in here wasn’t easy but it was definitely worth it. To be honest, I can’t remember everything we ordered. I think there was cornbread, mac & collards? None of it mattered because we had the beer can chicken and it made the night. This chicken is not subtle. It’s heavily spiced and has a definite kick to it. But its oh so good. I think I need to go out and buy a chicken / beer rack to attempt recreating this because I can’t stop thinking about this chicken. Yum. TK Stop #2 on our last night in California but this spot was actually the one we were most excited about in the anticipation for our trip. And it did NOT disappoint. This place is only open 5 nights a week and offers a four-course, family-style menu that changes daily. There are some famous standards that reappear regularly (Fried Chicken every other Monday) but for the most part when you make your reservations you’re expecting to be surprised. One thing you can guarantee is that whatever is on the menu it will feature the freshest produce, local ingredients and be absolutely delicious. The highlight for me was shockingly the iceberg salad (seriously!) with ingredients from The French Laundry Garden down the street. Bonus delicious points as we actually saw Thomas Keller nearby there the day prior. The steak was perfect especially alongside the truffle Mac & Cheese (additional but totally worth it.). Perfect way to end our trip and can’t wait to return – hopefully on a Friend Chicken night! Have any other must eats for SF or another favorite vaca spot? Let us know. We’re always adding to our lists of places to try! 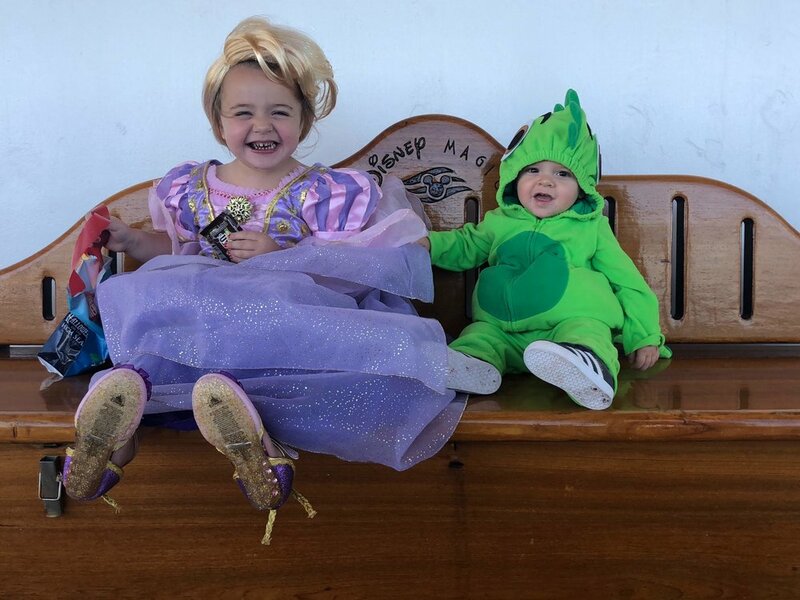 Halloween on the High Seas aboard the Disney Magic! A week ago the kids & I (and my mom, “Mimi”) returned from a 4-night adventure to St. John, New Brunswick, Canada aboard the DIsney Magic. This marked Elodie & my 3rd voyage on the Magic and Bennett’s first. Our last 2 sailings were long trips throughout Europe, so going into this trip I really didn’t think much of it. I really hadn’t put much consideration into the trip or gotten very excited. With the cruise being so short, it seemed like it would be a fairly normal weekend - just aboard a ship. Boy was I wrong. Laying out the day-by-day, play-by-play of our trip below. Want the Readers Digest? Disney Cruise Line (DCL) is amazing. The Magic is such a charming, wonderful ship to sail on. It doesn’t even matter what itinerary you choose. Do it. And bring us with you. If there’s a way to kick-off an amazing cruise, its sailing out of NYC. We’ve sailed out of Dover (UK), Copenhagen and Baltimore in the past but there is nothing like sailing down the glistening Hudson river, watching the skyline slowly roll by as you approach the Statue of Liberty and then swiftly breeze under the Verazzano Bridge. The city that never sleeps seems oddly quiet and peaceful as you watch it fade into the Horizon. The buildings sparkle in a way you don’t ever get a chance to see or enjoy while you’re in it or passing by in a car. It’s magical. 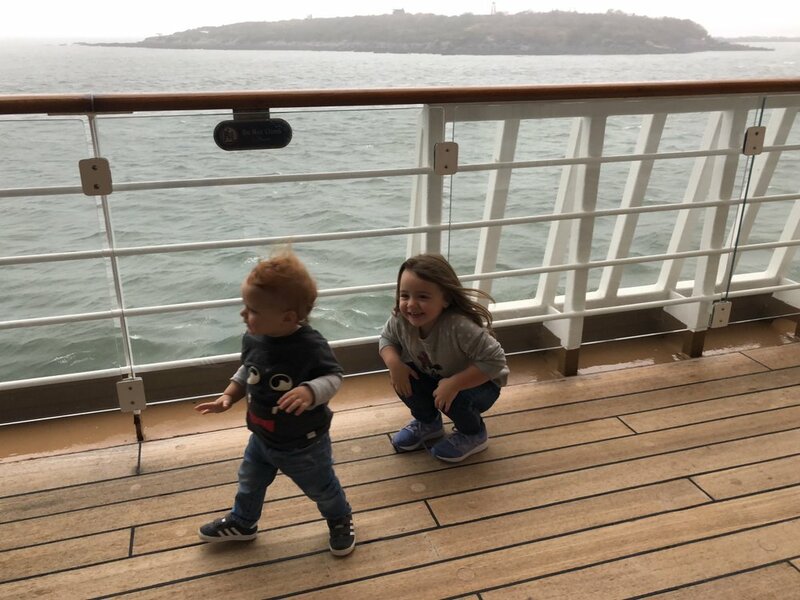 We boarded the DCL Magic at around 1:30PM giving us 2 1/2 hours to have lunch and enjoy “Open House” for all the ship’s special areas that are restricted to adults / kids or appointment once the ship sets sail — The bars, Spa, fitness center, kids clubs, etc. Main focus of this trip’s Open House was the Kids Club areas for 3-12 year olds - the Oceaneer Club & Lab. Since this was the first time Elodie was old enough to play & stay here, I wanted to make sure I had time to walk through the space with her, show her where the bathrooms were and make sure she was comfortable and excited. While the counselors are incredible and of course will help kids when they need it, they aren’t necessarily watching the super little ones to make sure they remember to use the bathroom or remind them where it is. It was a little nerve wracking thinking about her independently moving through such a huge kids club with so many (older) kids around. Spoiler alert, she was totally fine. But we did spend a solid hour in here letting her run, play and meet the counselors. Last all-aboard for DCL is 4pm, following which there is a mandatory safety drill for all crew & passengers. Shortly after, the ship set sail kicking off the cruise with a Sail Away Party on the top deck, complete with Characters and lots of dancing. On any other cruise from any other port I’d recommend making this top priority and securing a great spot to enjoy the fun. 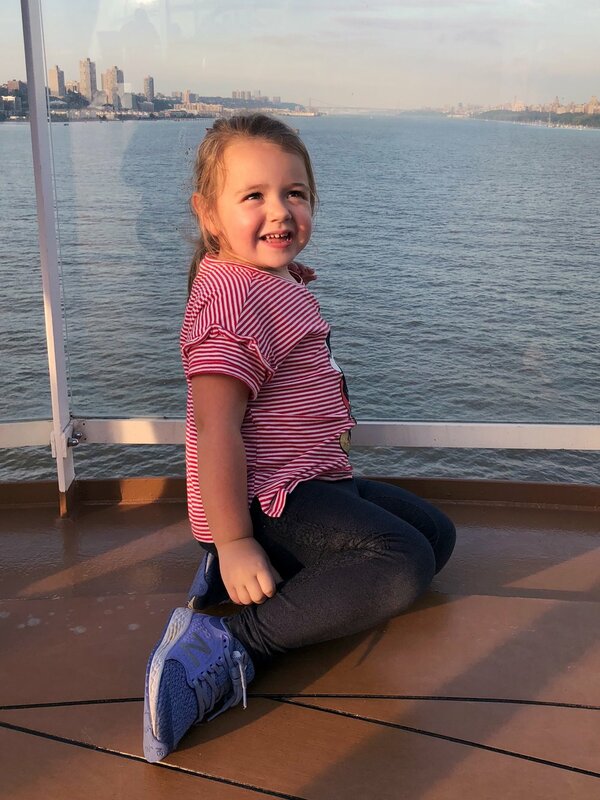 Leaving out of NYC, we popped into this quickly and let the kids see the characters but then quickly made a bee-line to the top deck, Aft to enjoy the views of the city and Statue of Liberty. We enjoyed the rest of our first evening browsing in the shops, letting the kids explore the ship and dining in Rapunzel’s Royal Table (RRT). For any past DCL Magic cruisers, RRT replaced Cariocas in the ship’s dry-dock refurb in 2017. It really wouldn’t have taken much to improve on Cariocas. But RRT is a dramatic and refreshing change from the old, tired & boring Cariocas. Beautiful ‘floating lantern’ ambiance, live music, great menu, interactive moments for the kids and appearances by Rapunzel, Flynn & a gang of Thugs make this new dining experience one to rival (if not top) Animator’s Palate. After dinner, the kids volunteered for more time in the Kids clubs and we gladly obliged, leaving them to toast a celebratory glass of Vino from the quiet & cozy O’Gill’s Pub. Then it was eventually off to enjoy being rocked to sleep by the motion of the ship. I’m one of those people who loves cruising so much I really don’t care what the destination is. If you’re like me, you’ll agree the Sea Days can easily rank as some of the best days of the whole trip. With nowhere to be and no pressure to rush to see something, you really can lean back, relax and do as little or as much as you want. I’m thankful the kids quickly fell in love with the counselors and play areas in the kids club and Small World Nursery, making it easy (and guiltless) to drop them off and enjoy some time roaming and relaxing around the ship. 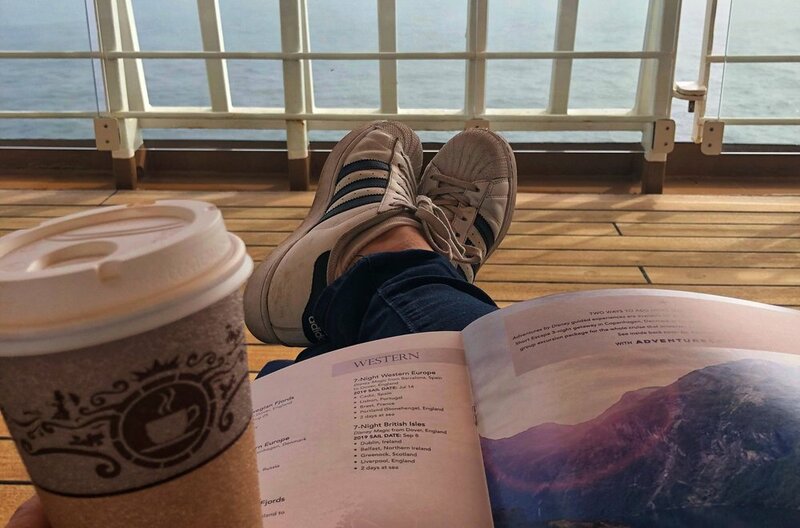 We browsed the shops, enjoyed specialty coffees in the Cove Cafe and then parked ourselves on deck-chairs outside, put our feet up and browsed the 2019/2020 future cruise options. In the afternoon, we let the kids run-off energy (and ice-cream induced sugar-rushes) in the adorable Donald Duck themed Aqualab Splash Pad. This little area is reserved for little-ones not yet big-enough to enjoy the more intense splash pad. It’s also the only area for babies who are not yet potty trained as they aren’t allowed in the Pools or the larger splash-pad which runs off into it. One great thing about this area of the pool deck is that its enclosed. Not only does it make it easier to contain kids, it makes it much warmer than the rest of the pool deck. A nice bonus when you are sailing Northern European or Fall weather cruises and the reptile-blooded kids want to swing, regardless of weather. We closed out this day enjoying the traditional DCL Pirate Night including dinner at Lumiere’s. I have to admit, I failed on preparation for this standard evening aboard any DIsney Cruise. I was so hyper-focused on Halloween costumes I completely forgot this was not only a thing but a pretty big deal - especially for repeat cruisers who know the drill. It’s not mandatory to bust out (or go buy) all the pirate attire you’ve ever desired to done. But you can’t really go overboard with this night. If you’re a person who loves a good excuse to dress-up and/or always wanted to spend a judgement-free evening dressed like a true swashbuckler, this is your place. My mom managed to piece together items she’d already packed into an impressive ensemble. I’m setting a reminder so we don’t drop the ball on this for the Summer 2019 cruise. Day 3 brought us to St. John; our only port day for this cruise. In general, we really do try and take advantage of Port Days, particularly when a ship brings us to a more remote place we may not easily get back to in a land-based vacation. 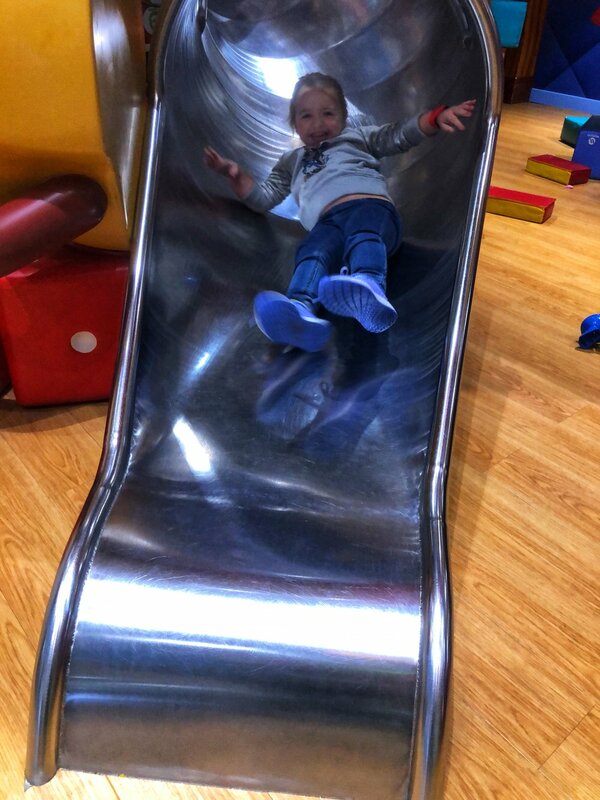 As amazing as the kids’ clubs are, unless there’s some sort of adventure that would be difficult with super kids (i.e. touring caves & meeting monkeys at the top of the Rock of Gibraltar) we make best efforts to bring the kids ashore. Unfortunately, this day and St. John were not working in our favor. While there are some great excursions available (whale watching, tours further up into Nova Scotia) and really interesting things to see nearby (Bay of Fundy, Reversing waterfall) it was extremely cold, rainy and not a great day for exploring. With the weather being so raw, we gave the little guy a pass and checked him in to spend a cozy day at the Small World Nursery. 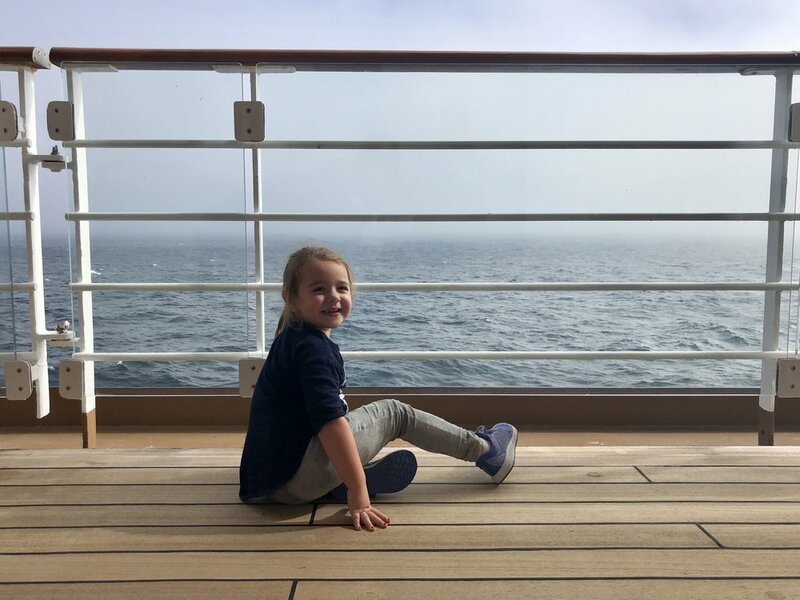 Not knowing how well my 3 year old would cope aboard the ship if she was ready to leave the kids club and I wasn’t aboard to pick her up, I took her with us. I thought the experience might be nice, we could roam through shops and worst case scenario she could be bribed with local treats & an obligatory donut in Tim Hortons. I was wrong on all accounts. We gave it a valiant effort, ducking in and out of shops, buying my daughter’s cooperation and trying to soak up the little town close to the ship. But in the end, cold winds and torrential rain forced us back onto the ship within a couple of hours. As much as we love exploring ports, I can’t say we were overwhelmingly disappointed. If you need or choose to stay onboard, Port Days are great days on the ship as its generally empty and super quiet. We spent the rest of the rainy day, letting the kids enjoy the clubs, seeing a movie (Incredibles 2) and greeting characters. Dinner was at Animators Palate, where Elodie enjoyed watching the restaurant change from Black & White to color and the finale appearance by Mickey. After some evening time in the kids’ clubs and adult bars, we ended the evening together in the Promenade lounge. Tucked away behind this lounge/bar area is a small space where the littlest travelers can safely play and climb on big foam blocks & shapes. It’s a space we’ve spent a lot of time in on past cruises and was a perfect spot to let them run off late night energy before heading back to the cabin. Added bonus that you can easily hear the live music from the adjacent lounge. This particular evening the lounge was shockingly empty, leaving the dance-floor open for my mom and kids to enjoy their own private dance party to their selection of tunes. Halloween on the High Seas! The festivities did not disappoint! For Halloween lovers (like myself!) its so fun to have an extra day to dress up and celebrate! There were parties with the characters, special photo opps, trick-or-treating with obscene amounts of candy and 3-D singalong viewings of Nightmare Before Christmas. And we did it all. The kids pushed through a jam-packed afternoon and evening, in-costume the whole time. It was serendipitous our last dinner was scheduled for RRT which was the perfect backdrop for our ensemble. We finished up the evening letting the kids run in the open-house at the Kids Club, which we had all to ourselves again. All in all, absolutely perfect end to a wonderful trip. The next morning we had an early breakfast at RRT, said goodbye to our favorite server (who we sailed with 2x prior) and head off the ship… thankfully with 2 more cruises aboard the Magic on the Horizon: Summer 2019 and Winter 2020! Let the countdown begin! Have comments or questions about our trip, DCL or the Magic? I’d love to chat! Drop me a line!